A high ranking member of the Houthi movement speaks to Al Jazeera about the movement's endgame in Yemen. On September 21, Houthi fighters took control of all state institutions in Sanaa, overrunning an army brigade affiliated with al-Islah, Yemen's Muslim Brotherhood party, making them effectively the power brokers in the country. On October 2, Gulf Arab states demanded the restoration of government authority in Yemen, issuing a thinly veiled criticism of rebels with ties to Iran. Its critics claim that Ansar Allah, the Houthi movement's political wing, lacks political expertise and yet it was able to ride the wave of popular anger over the government's decision to decrease fuel subsidies. Ansar Allah mobilised thousands of supporters to surround the capital from three different sides and demand that the government rescind what it considers as a price hike. They also called for the resignation of the cabinet and the implementation of the outcome of Yemen's National Dialogue - that's the process which ended the post-revolution violence. Several presidential envoys failed to persuade the Houthi leader, Abdel Malek al-Houthi, to accept a peaceful arbitration. Meanwhile, the Yemeni public is divided: While many supported the protest against the price hike, others were unnerved by the Houthis' military operations. The al-Islah party has also been left out of the process. 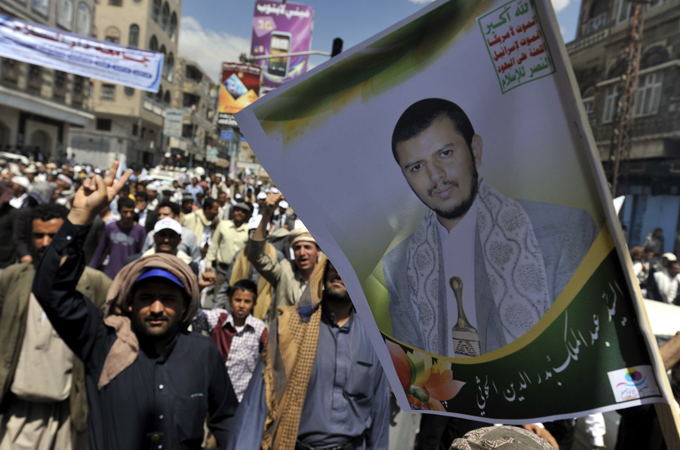 The Houthi leader has blamed the party for all of the country's ills and rampant corruption. While Yemen's President Abd Rabbu Mansour Hadi seemed indifferent to his country's deteriorating situation, his critics charge that he was compliant with the Houthis. Al Jazeera spoke to Mohammed al-Bukhaiti, a member of Ansar Allah's political bureau, about the deepening crisis in Yemen, the Houthis' endgame and the relationship with Tehran, the president, and al-Islah party. Al Jazeera: When will the Houthis withdraw from the capital? Mohammed al-Bukhaiti: We will only do this when the government is formed. We have made it clear in the agreement that we will do so once there is a government that can assume security duties. This is not about a takeover of the capital. In fact, it is a huge burden for us to be responsible for law and order across the capital and we want to see the end of it when a new government is formulated. AJ: Can you confirm news reports that Houthi fighters are besieging the Saudi embassy in Sanaa? Al-Bukhaiti: This is not true. The media overplayed this. We are only there to protect those places including government installations, embassies, and main roads because there are hardly any security forces in the capital now. Just a few days ago, the military police forces began patrolling some areas. AJ: How would you describe your relationship with the Yemeni president? Many accuse Houthis of undermining the president and even working to oust him? Al-Bukhaiti: During our protests, we did not call for the president to step down because we realised that the current state of affairs in Yemen, with all state institutions out of order, could not benefit from that. Indeed, we have rejected the Gulf initiative and we did not take part in the presidential elections. President Hadi is the only statesman about whom there is wide consensus among Yemenis across the board. And we do not want to go against this consensus. The sectarian factor has never been an issue in deciding who we ally ourselves with. While it is part of who we are but it occupies a secondary role and is not a decisive factor. AJ: Have you reached a consensus over who should be the next prime minister? Al-Bukhaiti: We have picked Ayoub al-Hamadi, an independent university professor. We want people with integrity to be able to combat the chronic problems of corruption plaguing the Yemeni ruling establishment. AJ: How would you describe the relationship with Tehran? Given that the conflict in Yemen has been framed along sectarian lines between Yemen's Shia population (represented by the Houthis) and the Sunni leaders of al-Islah party. Al-Bukhaiti: They say because Tehran lost Damascus, it took over Sanaa. This is an inaccurate analysis of the situation in Yemen. We are where we are today mostly because of domestic politics and power relations among political actors. What we have in common with Iran or Hezbollah [because the comparison was also made between the so-called Houthis' takeover of Sanaa and the Hezbollah takeover of Beirut in May 2008] or Hamas and Islamic Jihad, is that we have a common stand vis-a-vis Israel and US and we will cooperate with any political actor in the region who stands in the face of the US regional designs. But to grasp the complexities of the situation in Yemen, we should only look in Yemen for answers and not in Tehran or Lebanon for that matter. AJ: But did you, at any stage of the conflict, receive logistical or military support from Tehran? Al-Bukhaiti: The short answer to this is a categoric no. As for the sectarian aspect, Yemeni people, across the spectrum, do not perceive the conflict as such. The sectarian factor has never been an issue in deciding who we ally ourselves with. While it is part of who we are, it occupies a secondary role and is not a decisive factor. It is the other groups, al-Islah party and their allies, the al-Ahmer tribe, as well as some power centres within the government, that sought to use the sectarian card and frame the conflict along sectarian lines, however, in Yemen, tribal affiliation and Arab nationalistic sentiments have more of an influence among Yemenis than the sectarian identity. AJ: So does this mean there has not been any backdoor negotiations or talks between Ansar Allah and al-Islah party during the recent crisis? Al-Bukhaiti: Al-Islah party has a large popular base and is a force to be reckoned with in Yemeni political scene and should be included in the political process, however, it should not have a monopoly over the decision-making process as had been the case before. The relationship between the Houthis and al-Islah is not at its best because of the wars that were waged against us which we believe al-Islah has been a primary party in, even if they deny this. We, however, hope to have a new beginning with the party. And for well over a year now, we have made several attempts to get al-Islah's leadership to sit at the negotiation table to settle the conflict but they always came back to us with one answer: They are not part of the conflict. They are the ones turning down our calls for national dialogue. AJ: How would you define the Houthi movement and what is your endgame? Al-Bukhaiti: We are a national movement that strongly subscribes to the principles of Arab nationalism and pan-Islamism.